The signal ahead (at 4th) was the east terminus of US 117 during the late-1920s/early 1930s; the east end of US 158 during the rest of the 1930s, and then the north end of US 258 in the mid-1940s. 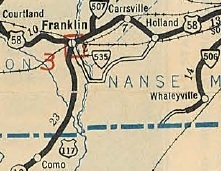 In 1945, US 258 was extended further north from Franklin, and that was the same year that traffic was changed to follow its current path through town: South Street, Main Street, 2nd Avenue. 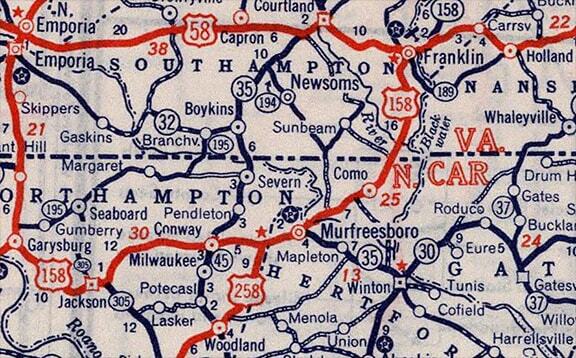 So it is interesting that, over 60 years later, High Street was still signposted as if it is a highway. It is also interesting that "West US 58" had a straight-ahead arrow, because westbound Business 58 is actually to the left on 4th. Actually, that assembly is an artifact that references an historic routing of US 58, dating back to a time before the current bypass had been built. last updated Apr. 5, 2017.